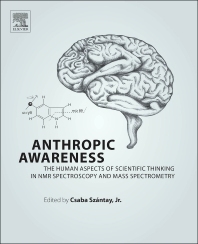 Anthropic Awareness: The Human Aspects of Scientific Thinking in NMR Spectroscopy and Mass Spectrometry blends psychology, philosophy, physics, mathematics, and chemistry, describing a human-centered philosophy of the essence of scientific thinking in the natural sciences and in everyday life. It addresses the reasons why we are prone to make errors in our conclusions and how to avoid such mistakes, also exploring a number of the "mental traps" that can lead to both individual mistakes and mass misconceptions. The book advocates that by understanding the nature of these mental traps we can adopt tactics to safely evade them. It includes Illustrative examples of common scientific misunderstandings and mental traps in both the theory and real-life application of NMR spectroscopy and mass spectrometry. Scientists working in industry and academia in the areas of drug discovery and natural product research, consumer products, food science, forensics, and cosmetics (including but not limited to analytical, organic and medicinal chemists), and graduate-level students in chemistry. 3.4 Where Did It Go Wrong? Csaba Szántay, Jr. was born in Budapest, Hungary, but partly attended elementary school in Bufffalo, NY, USA. He obtained an MSc degree in organic chemistry from the Budapest University of Technology and Economics in 1982 with his final thesis involving the methodology and use of NMR spectroscopy. Subsequently, he became a PhD research fellow in Prof. Gábor Tóth’s NMR laboratory at the Department of Analytical Chemistry, Budapest University of Technology and Economics, and obtained his PhD in 1986 in NMR. After that, he worked as a postdoctoral fellow in the NMR laboratory of the University of Leeds, UK. Having returned to Hungary in 1989, he became a member of the NMR team of the Spectroscopic Research Division of the Hungarian pharmaceutical company Gedeon Richter Plc. He was promoted as head of the Division in 1994 and has been in this position since then. He has also maintained a teaching position at the Budapest University of Technology and Economics. He received a “Candidatura” degree in 1991 and a “Doctor of Sciences” degree in 2000 from the Hungarian Academy of Sciences for his work in NMR spectroscopy. In 2003, he was became a Private Professor at the Budapest University of Technology and Economics. Besides holding several positions in various scientific committees, he is on the Editorial Board of the journal Concepts in Magnetic Resonance and is currently the president of the Hungarian NMR Discussion Group of the Hungarian Academy of Sciences. Along with his managerial duties, his main fields of research interests are the structure elucidation of organic molecules and the theoretical aspects of NMR. He is the author/co-author of more than 100 papers published in international scientific journals.